You rarely see SO much excitement over a new Bushwick bar opening. Unless, of course, it is something really special. Like a giant warehouse with a view over all of Bushwick that plans to be not only the largest beer garden in New York, but also an insane music hall. Yes, we are talking about The Well on 272 Meserole Street (off Montrose L stop). The Well is throwing their first party and a concert this Saturday, July 14 from 4pm to 10pm, and they invited some big names to honor this big occasion. 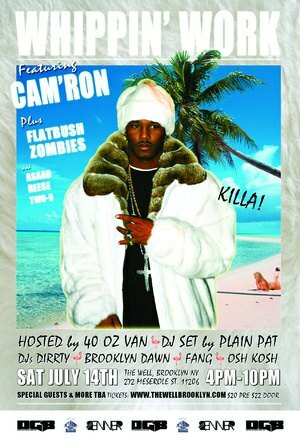 Grammy nominated rapper Cam'ron assisted by Flatbush Zombies, and Asaad & Reese will kickstart the night. Tickets to participate in these hip hop festivities are $20-22, which might be a bit pricy for Bushwick but then the line up is stellar AND if you're lucky you can win a ticket on The Well's Facebook page. The following shows are planned for late July and August and will feature The 12th Annual Kustom Kills & Hotrod Thrills, OS MUTANTES or Peter Murphy. Our expectations are about as giant as this venue...So let's see this Saturday!